Following his Sitayana (1987), Prof. Iyengar's Saga of Seven Mothers: Satisaptakam is a re-telling in verse of select Tales from India's munificent Epic and Puranic heritage, notably the Mahabharata, the Bhagavata and the Tamil classic, Sitappadhikaram ('The Lay of the Anklet'). The Seven Satis invoked here-DEVAHUTI, SUKANYA, DEVAYANI, DAMAYANTI, RENUKA, DRAUPADI, and KANNAKI - team into a spectrum of archetypal variety projecting almost a parable of Evolution spanning a whole Yuga Cycle. These Seven near-apocalyptic visions of maidenhood-womanhood-motherhood, distinctive in their tints and contours, nevertheless merge into the all-inclusive Ray, the pure White of Adya Shakti. As in Sitayana, in Satisaptakam too, the focus is less on the protagonist male and much more on the Sati-heroine and her psychic compulsion to face and master increasingly difficult or complex situations thrown up by the evolutionary drive that carries the race forward, from the Gold and Silver to the Bronze and Iron Ages. Isolable and autonomous on a first view, the Seven Tales can nevertheless be viewed as a Rainbow Arc of the Eternal Feminine, an ensemble of Sati-images that are no doubt reminiscentially 'old world', Itihasic and Puranic, yet not lacking in perennial as well as pointedly contemporaneous appeal. Neither close translations from the original Sanskrit or Tamil, nor planned abridgements, these verse narratives often follow their own course as determined by the artistic drive of the moment. And the 'Prologue' and the 'Epilogue' are meant to provide a present-day and rather personalised setting for high-lighting the interweaving of change and continuity in this Legend of Seven Noble Mothers. The Saga is written in the unrhymed quatrain measure already used with a degree of success in Sitayana. With its convincing evocation of past ages and its vivid portraiture of Adya Shakti in Seven of her terrestrial manifestations, Satisaptakam will make a ready appeal to a wide circle of lovers and students of Indian culture and literature. Born on 17 April 1908, K. R. Srinivasa Iyengar took his M.A. and D.Litt. from the University of Madras: taught at Belgaum and Bagalkot before shifting to Andhra University in 1947 as professor of English, and retired as Vice-Chancellor in November 1968; elected Vice-President of Sahitya Akademi in 1969, served as Acting President in 1977-78. He is Hon. Member of Modern Language Association of America, Fellow of Sahitya Akademi, and Vice-President of the P.E.N. All-India Centre. He has served as Member of the Press Council of India, and received the D.Litt. honoris causa from Andhra, Sri Venkateswara and Nagarjuna Universities. He is Adhishthata of Sri Aurobindo Ashram (Delhi Branch), and a Dr. Kalidas Nag Memorial Medallist. His works include Sri Aurobindo: A Biography and a History; On the Mother (which received the Sahitya Akademi award in 1980); critical studies of Shakespeare, Gerard Manley Hopkins, Lytton Strachey, Francois Mauriac and Rabindranath Tagore; biographical studies of Vivekananda and S. Srinivasa Iyengar; and collections of Essays and Talks like The Cheers for the Commonwealth, and Academic, Two Cheers for the Commonwealth, and A Big Change. Several of his contributions appear in the New Catholic Encyclopaedia and the Encyclopaedia of Indian Literature. His books of verse include Tryst with the Divine, Australia Helix and the epic, Sitayana. 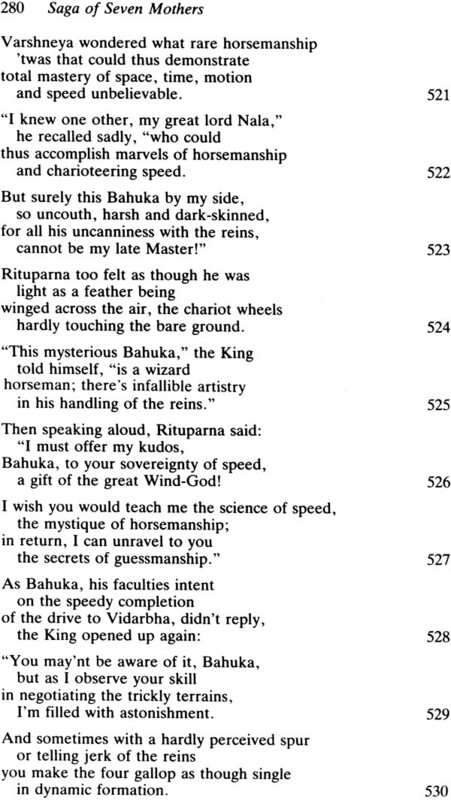 He has rendered into English verse, from the original Sanskrit, the Sundara Kanda of the Ramayana of Valmiki, Devi Mahatmya and Atma Bodha; from the original Tamil, Tirukkural, and Selections from Tirumandiram and Tiru-Arutpa; and from Kannada, in collaboration with S. S. Basawanal, the Vachanas of Basava. Prof. Iyengar presided over the All-India English Teachers Conference at Jaipur in 1963, represented India at the PEN-UNESCO sponsored East-West Symposium in Tokyo-Kyoto in 1957, and took part in the World Conference on Religion and Peace at Leuven in 1974. He was Visiting Professor at the University o Leeds in 1959, and has given Foundation Lectures in several Indian Universities and under the auspices of various organisations. It is a pleasure to record my gratitude to the readers and reviewers of my earlier Sitayana, for it was their warm reception of the Epic that has made possible this Saga: Satisaptakam. And in particular I should mention two valued friends, the savant and Yogi Sri M. P. Pandit of Sri Aurobindo Ashram and Prof. V. Y. Kantak of Baroda, a critic and Rasika equally at home in Indian and Western literature. Another friends, Sri V. Sadanand of Samata Books, has with courage and faith taken the responsibility for the publication of the Saga. I thank too Sri Saphal and his dedicated staff at All India press for producing the Saga with the same taste and finish as in Sitayana. And Sri Jayantilal Parekh, with his feeling for beauty and his wide-ranging experience, has taken an active interest in the printing and publication of both Sitayana and Satisaptakam, as also of my biographies of Sri Aurobindo and The Mother. Nor should I fail to mention that my wife, Padmasani, my son Ambirajan, and daughter Prema Nandakumar, have sustained me with the ambience of silent support while the Saga was being written and was later seen through the press. I may add that 'Invocation' appeared first in Awakening (November 1988), and 'Mother and the Mothers' and 'Lines of the Descent of Consciousness' in Bhavan's Journal (Diwali Number 1988 and Annual 1990). My thanks are due to the respective Editors. Satisaptakam is a Saga of Evolution, which is an unfinished process yet; and the ordained Future is a contingency still to be realised in the plenitude of Time. This Saga inevitably reflects the incompleteness, although the eyes of Faith can perhaps peer beyond the current Night and glimpse the coming Dawn. 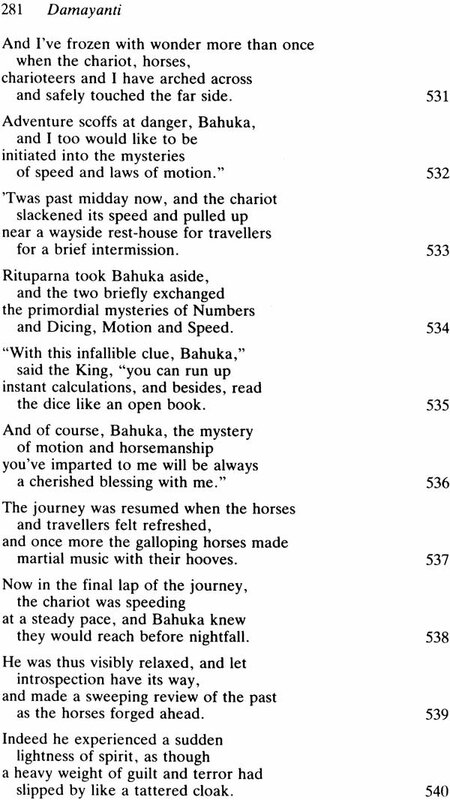 Late in life and past my seventieth year, I began an English verse translation of the 'Sundara Kanda' of the Ramayana of Adikavi Valmiki. It was more by accident than as anything like a planned adventure. I was no Sanskritist, and was no regular reader - like my parents, elder brother, or my wife - of the 'Sundara' as part of the daily ritual. But once started on the absorbing exercise in May 1980, I persevered and completed my rendering by August 1982, and Sahitya Akademi published it as The Epic Beautiful. One thing led to another, and I was tempted to embark on are-telling of the entire Ramayana story, but consciously tilted towards the epic heroine, Sita. It was to be Sitayana, then, the Saga sublime of her heroic sufferance: Sitayah Charitam Mahat. Begun in January 1983, and after the inevitable seasonal fluctuations of doubt, slackness, revived enthusiasm and spurts of progress over a period of nearly four years, this 'Epic of the Earth-born' was completed at last, and my friend, Sri V. Sadanand of Samata Books, publishers of 'quality spiritual classics', readily offered to sponsor Sitayana, and it was released on Sri Rama Navami, 7 April 1987. What next? The question had been teasing me ever since Sitayana was out of my hands, and although I made tentative soundings and uncertain starts, there was no take-off. Then I began experimentally a recital of the story of Vishnu's 'Incar- nations'. Hadn't Sri Aurobindo described them aptly as "a parable of evolution" - from Fish and Tortoise to Boar and Man-lion, and from Dwarf and Kinetic Man to heroic Rama and Krishna, Mahavira and the Buddha? 'The Incarnations' in 475 quatrains has since appeared serially in Sir Aurobindo's Action from September 1988 to August 1989. But this was no more than an enlightening diversion, and the main problem remained. It was now clear to me that the intended companion to Sitayana should also concern itself with the Eternal Feminine, the Adya Shakti in varied candidly human manifestations. I felt too that, just as Sitayana was conceived as the 'Epic of the Earth-born', my new effort should in some way project the phenomenon of Evolution as, specifically related to the feminine psyche, and perhaps in contrast (or as complementary) to the evolutionary indications in the male of the species. Why not tell, then, not one story but a series of seven: a Saga of Seven Heroic Women, Seven Noble Mothers? Satisaptakam! The Eternal Feminine and the Sacred Seven: the possibilities were indeed worth exploring. For the philosopher in India, the three magnets of fascinating and compulsive ascent are the Prastana Traya, the summit-heritage comprising the principal Upanishads, Brahma Sutra, Bhagavad Gita. Even so, the serious literary aspirant in India finds in the twin Itihasas and the Bhagavata Purana the unfailing triple stream of inspiration, the Triveni of Ganga- Yamuna-Saraswati. Age after age, in one living language after another, the ancient myths and legends, the superb character- creations and archetypal situations, the splendid dialectical climbs and the daring flights of speculation have achieved memorable recordation; and no wonder that, while our literature speaks in eighteen or more languages, the same mind, heart and soul are the unfailing inspiration. As I marvelled at this extraordinary phe- nomenon of unity in diversity, the suggestion came from within: "After Sitayana, look for a constellation of Sapta-Matrika, Seven Mothers, amidst the breath-taking munificence of the Maha- bharata, the Bhagavata and similar seminal classics." There was, of course, no question of taking on the Mahabharata in all its awesome immensity, for it is a vast literature by itself, and not just a Kavya or even Itihasa. No question either of trying to render in English verse the many-faceted Bhagavata in its totality, or opting for an abridgement of its Twelve Books with their rich content and nectarean flavour. But the Itihasa and the Purana do certainly project a whole variegated gallery of the choicest flowers of the Eternal Feminine. Ancient Tamil epic poetry too has immortalised elected emanations of Adya Shakti - for example, Kannaki in Sage Ilango's Silappadhikaram. Valmiki, Vyasa, Ilango: seer-poets all, and creators of nurslings of immortality! Thus it was that eventually I made a choice of seven images of girlhood, womanhood, motherhood: Devahuti, Sukanya, Devayani, Damayanti, Renuka, Draupadi, Kannaki. Like the seven swaras in music, like the seven colours of the rainbow! Couldn't they be visioned as the music of maidenhood, the rainbow arc of womanhood, the golden glory of motherhood? Seven of Adya Shakti's emanations, seven choice petals of the Rose of God? And so my choice was made, and I felt committed to telling the stories of the elected seven as Satisaptakam or Saga of Seven Mothers. The Prastana Traya for the philosopher, the Itihasa pair for' the man of letters! I thought I would try to re-tell the stories of six of my selected seven, primarily in debt to the Mahabharata and the Bhagavata, and drawing also upon other Puranic and folk-lore sources to the extent feasible, but always deeming myself free to change, modify or improvise as the narrative moment, mood or logic dictated. Sometimes an inner compulsion seemed to indicate the change of scene, the dynamic of action, the unfoldment of speech; and I had often the feeling that, not I, but the Tale was forging both the decision and the actual writing. It was as though the Stories, springing out of the rich soil of our hoary heritage, were by a strange necessity achieving growth and foliage, flowering and fruition, almost on their own. And for the 'Kannaki' story, my main source was Ilango's Epic, though my own Tale is rather more than a mere abridgement and recycling of the 'fable' in Silappadikaram. Altogether I feel I have perhaps been more free with the management of my sources in Satisaptakam than in Sitayana. In the result, while my debt to Sage Vyasa (who is credited with the composition of both the Mahabharata and the Bhagavata) and the saintly Ilango is immense, fundamental and generally all-pervading, nevertheless these Seven Tales are neither mere translations nor consciously faithful abridgements; and the warts and false notes and other shortcomings are solely mine, issuing from my own insufficiencies in creative impulsion and energy, and narrative power and expertise. Of the Seven Tales, 'Draupadi' is the spinal strength of the Mahabharata recital of the phenomenal rivalry between the Pandava Five and the Kaurava Hundred, climaxing in the eighteen-day fratricidal war on the soil of Kurukshetra. Just as my participation in Sahitya Akademi's Ramayana Seminar in Delhi in December 1975 helped me when I later started on Sitayana, likewise my involvement in the Mahabharata Seminar held in February 1987 was both an education and an inspiration for my essaying the perennially contemporary heroic Tale of Draupadi. The 'Kannaki' story draws chiefly upon Ilango's 'Lay of the Anklet', and to some extent Sattanar's Tamil epic, Manimekalai. 'Damayanti' is based on the spacious 'Nalopakhyanam' in the Mahabharata; 'Devahuti' and 'Sukanya' on the Bhagavata; and 'Devayani' and 'Renuka' on both the Itihasa and the Purana. The supporting dramatis personae, the situational and circumstantial machinery and the philosophical enunciations and spiritual illu- minations had all to be selectively transported into my Tales, and this was a daunting, and demanding, and sometimes also a gratifying adventure in understanding and story-telling and character-delineation. Always, always, the seminal debt has been to the trinity of seer-poets, Valmiki, Vyasa and Ilango. 'Seven Images of Noble Indian Womanhood': this might be a fair and apt enough description of the present work, Satisaptakam. But isn't there something more in the Saga of Seven Mothers than its aggregate critical weight? In other words, are the Seven Tales wholly isolable histories, - or whether indeed the Seven aren't really One, a dynamic and evolving Power and Personality, a single Rainbow Arc, the Seven colours subsumed as it were in the splendour of the White Rose?